Creative workspace company Spaces is moving quickly in Vancouver. Before even opening its first Gastown location, the co-working firm has announced plans for two additional locations. In total, the three sites will comprise about 145,000 square feet. “They’re each in very specific micro-markets in Vancouver, all of which have a tremendous need for co-working,” Spaces executive vice-president Wayne Berger said of the three deals brokered by Colliers Canada. The five-storey, 35,000-square-foot Gastown location at 151 W. Hastings St. will be the first to open this summer. It will accommodate 450 to 500 people and will feature a rooftop patio. The building combines Romanesque architecture with a modern style and is surrounded by restaurants, cafes, clubs, boutiques and galleries in a gentrifying neighbourhood. Spaces signed a lease for 70,000 square feet in the historic five-storey Tom Lee Music Building on Granville Street, which is home to a thriving nightlife scene. Spaces will occupy the entire office component of the 91-year-old building, along with prominent main floor retail space when it opens in October. It will provide work spaces for 800 to 1,000 people. 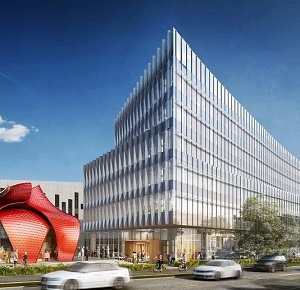 “In the building, we’re going to plan on having a lot of connectivity to the past and really bring out Tom Lee’s heritage in the space, while we incorporate a great Spaces co-working facility and also include some great amenities, like an independent coffee shop and some other amenities that we’re currently working on, but aren’t ready to announce yet,” said Berger. The final deal was signed in Mount Pleasant in Great Northern Way Campus, steps away from the new Emily Carr University of Art + Design and home to Vancouver’s burgeoning technology and startup scene. Spaces will occupy 40,000 square feet on two floors, which will accommodate 450 to 500 people. It will also feature multiple patios. The Great Northern Way Campus site is scheduled to open at the end of 2018. Spaces has signed long-term leases at all three locations and is making significant investments in the office designs and buildings. They’ll also each have an independent cafe and a dedicated space for Spaces members or the general public to host events. A study released by commercial real estate adviser Cresa last fall indicated there was 790,000 square feet of co-working space at 59 Vancouver locations, with 56 per cent of that total in the downtown core. There’s a growing market for co-working space in Vancouver, according to the study. International Workplace Group acquired Amsterdam-founded Spaces in 2015. It also owns the Regus, No18, Basepoint Business Centres, Open Office and Signature co-working brands, which have almost 3,300 flexible workspace locations in more than 110 countries. Regus has 21 locations in Vancouver and the Lower Mainland, and Berger said there’s a need for more solutions both from his company and its competitors. Office space remains at a premium in Vancouver, but more of it’s being dedicated to co-working space occupied by individuals, small firms and large companies involved in both technology and more traditional fields. In the past, there’s been some pushback from landlords about renting to third-party operators due to concerns such as losing control of their tenant base, higher density ratios putting pressure on systems, and wear and tear from more frequent tenant turnover. Today, however, Berger said building owners and managers now want to work with companies like his. Berger added he’s had discussions with property owners interested in directly providing co-working space to tenants. He wants them to understand the work and day-to-day responsibilities involved with running such operations. Spaces opened its first Toronto location at 180 John St. last fall. It continues setting down roots and is looking to grow there and in Montreal as well as Vancouver. More Spaces flagship locations across the country are planned, while Regus is also looking to expand beyond the 42 Canadian cities where it already has a presence. Berger cited research that predicts 30 per cent of commercial real estate will be dedicated to co-working space by 2030 as more people become part of the “contingent workforce” of freelancers, entrepreneurs, independent owner/operators, contractors and consultants. As this employment sector grows, Berger said co-working spaces will also become more important as social hubs. “It’s amazing how people connect on a social level in these types of environments. They can become lonely being an independent entrepreneur or an individual operator. People are social beings and they want to be around each other.